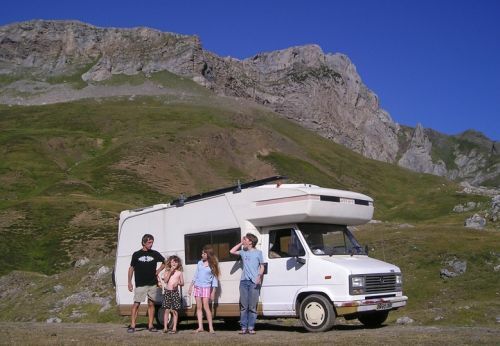 One of the fundamental ideas behind our cruising lifestyle is that it’s environmentally sustainable – which is why, when Nick first mooted the idea of travelling overland in a campervan I was in two minds. On the one hand, having spent so many years hugging the coastline of this great continent of South America I was very eager to take a look at what goes on inland; but at the same time, I don’t like to do anything which pollutes the planet. I don’t like to burn fossil fuels unnecessarily. For more than a year we’d been crawling slowly up the coast of Chile via the network of islands and channels. We’d now seen far more of the wild, wet, windy, and cold part of Chile than most Chileans ever see in their entire lives – but we’d hardly glimpsed any of the inhabited bits. 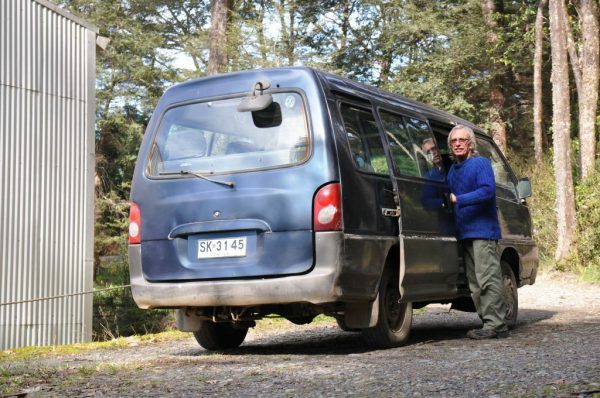 In September we popped out of the top of the Channels network, and we made our way up to Valdivia. Ahead of us there now stretched a long, spartan coastline – a coastline pretty much bereft of cosy harbours. Somewhere up there lay the Atacama desert, and beyond the desert lay Peru and Bolivia. I very much wanted to see these places – but… But not if it meant living recklessly. When you think about it, almost every use of fossil fuel is, by definition, reckless. Whenever we buy plastic-wrapped food we’re living recklessly; and whenever we travel around in machines which depend on an internal combustion engine we’re living recklessly. When we do these things, it’s actually costing us the Earth, and you really can’t get more reckless than that! However, it’s clear that some things are much more reckless than others. We do have to eat, and it’s not at all easy easy to buy food which isn’t plastic-wrapped. 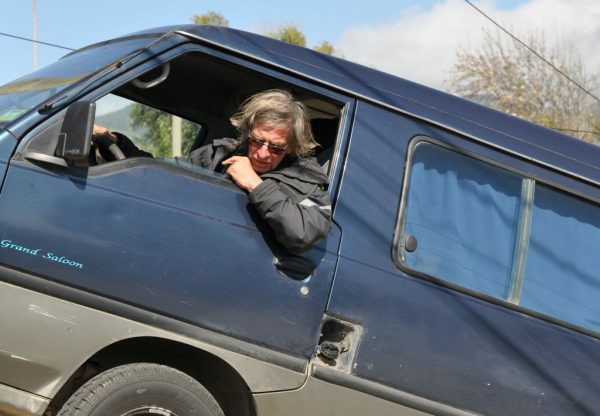 On the other hand, travelling thousands of miles in a campervan just for the fun of it… well, that definitely belongs in the Most Reckless category. 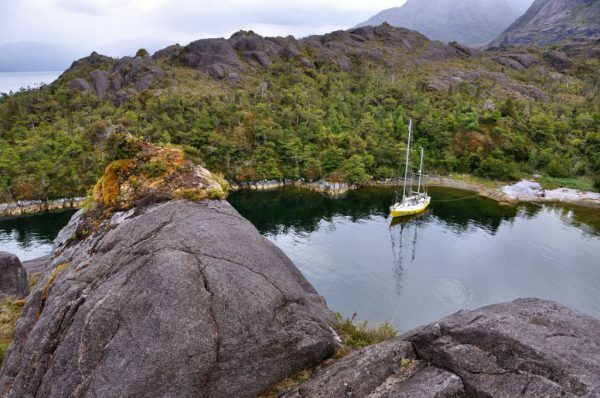 With this in mind, I argued in favour of sailing north from Valdivia all the way up to the other end of Chile – and then we could hire a van to travel into the Atacama desert and into Peru. That seemed to me like a reasonable compromise, entailing a much smaller carbon footprint and a little bit less guilt. There were, however, various reasons why this idea was undesirable and impractical (one of them being our urgent need to slip the boat immediately after this overland trip) – and so it was that my motion was defeated, three to one. And so it was that Nick set out one sunny morning to buy a campervan. 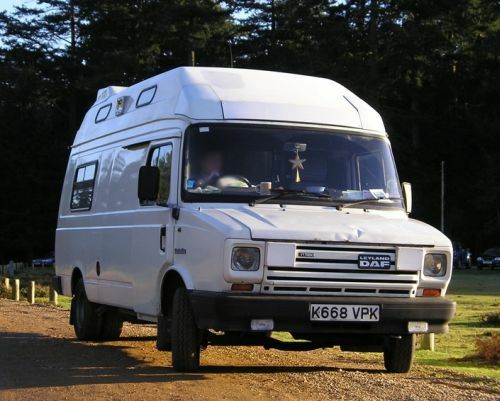 When I say, a campervan, what I actually mean is a van which could be converted into a very basic camper. We didn’t need anything fancy. We just needed a vehicle with seats for the four of us, windows to see the view, and enough space for everyone to lie down. So, one day Nick hopped on the local bus; and a few hours later he came home driving it. Well, not the same bus, but a similar one. Nick has a lot of experience in buying old bangers and making them work – he is, after all, a mechanic by vocation and by trade – and we already have a certain amount of experience with campervans. Our first van was an ancient VW kombi called Bertie. When Bertie proved to be a tad on the small size for a family of five plus the dog, we progressed to an ambulance called Sam, and we fitted it out, in a makeshift fashion, with bunks and a place to cook. From some points of view this second vehicle was ideal. Ambulances are designed to go just about anywhere – you can pretty much drive them across a ploughed field – and they’re also designed to be fast. 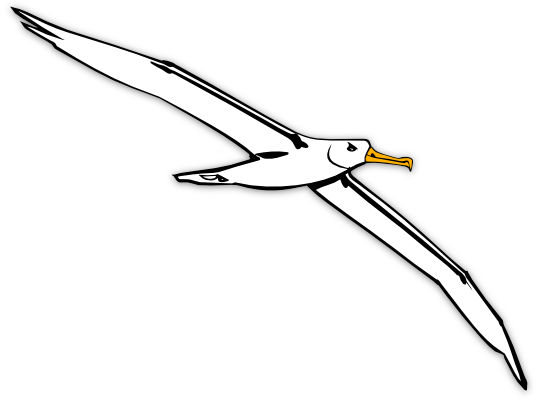 (Part of their speed is derived from the fact that they have VIP status. We found that even after the stickers and the lights have been removed other road-users still clear the way ahead of an ambulance-shaped van!) On the debit side, there are no windows in the back of an ambulance – people being rushed to hospital are not interested in the view – but if you’re travelling for the sake of travelling, then the view is what it’s all about. The three who drew the short straws and travelled in the back of Sam always had a very boring ride; and so, after a few months, we moved on to ownership of Tigger, an old but very well equipped Kontiki Swift. The contrast between the Kombi and the Kontiki was enormous. With five berths, a galley, and a shower/loo compartment, the new acquisition was the caravanning equivalent of a cottage, whereas poor old Bertie was just a beach hut (and Sam was a shed). The Kontiki was perfect for exploring Spain and France – it was neither too big to park easily and discreetly nor too small to be comfortable – and if it had been as seaworthy as its namesake then we would have taken it across the ocean, too. We once encountered a South African yacht with an interior consisting of a campervan. 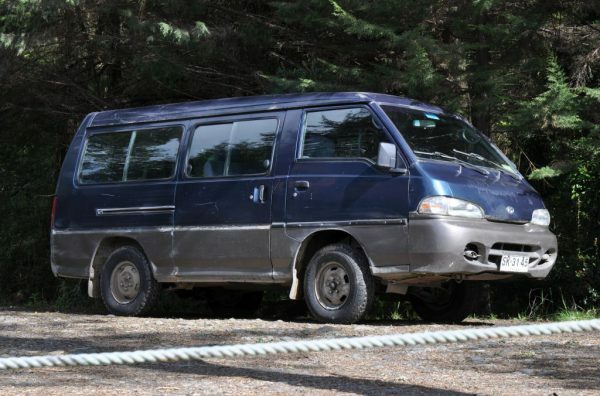 The owner had circumnavigated Africa and japan, and he told us that whenever he arrived at a new destination he simply craned out the van, using his boom, and went touring overland! This idea is massively attractive, but the reality is that you end up with only half the living space – basically, you’re using your whole interior as a garage for the van – and in order to accommodate a van with a high-top (and enough headroom to stand up) you also have to raise the vessel’s deck and raise the boom, thereby diminishing the sail area. Somewhere, I am sure, there is a doodle-pad filled with whimsical ideas for solar-powered amphibious campervans – and one day they will be a reality. But in the meantime… We had neither the time nor the money to invest in a solar-powered wonder, and so, as I say, Nick went shopping, and he came home with a battered and bruised Hyundai Grace. I’m so accustomed to Nick’s Bargain Basement buys that the state of this Amazing Grace didn’t arouse too much concern. Okay, so the back door was held shut with string; and the side door could only be opened from within; and there was a hole in the exhaust. And having been used as a bus for 20 years, the thing had been round the clock at least once. But, hey, it worked! Alas, however, it transpired that on this occasion Nick was out of luck; it didn’t work for long. On her first journey into town, Grace blew her head gasket. 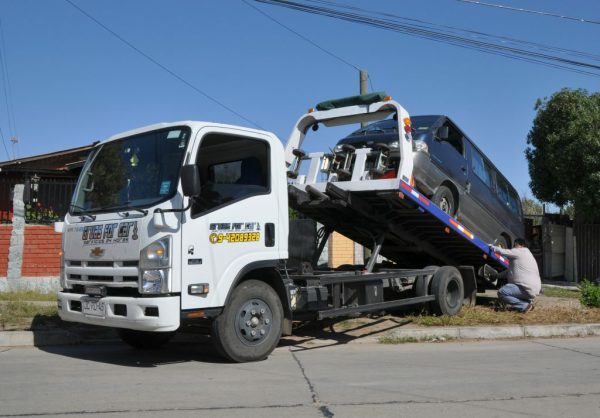 This being Chile (a land of saint’s days and long weekends) it took two weeks to get a new gasket and to have the cylinder-head checked for cracks – and that was two weeks of our one month holiday gone. Why only one month? Well, that was the time available before we would be able to slip Mollymawk for some much-need TLC; and that was the time during which our good friends, Mikael and Lena, would be available to take care of Poppy and Fish. The more possessions and commitments we have in this life, the more we ensnare ourselves, and there is no greater snare for the traveller than being committed to the welfare of a dog and a cat… But we’ll talk about that some other day. “It’s just the steering,” said the mechanic, and we detoured into Valdivia to buy some special fluid for the gubbins. A long journey should not begin with breakdowns – it should begin with the vehicle in tip top condition – but time was running out. Another day of tweaking would be another day of not travelling. And so, as soon as the steering system had been fed and watered, we left. At long last, we were on our way north. North, away from the rain! North, through a landscape vastly different from the one we had explored with our boat: A landscape tamed and modified and occupied by man. After travelling for a few hours past wet woodlands and damp fields, and through the outskirts of various small shabby industrial towns, we came to a fertile plain. Here, the woods had been banished to make way for vineyards, orchards, and orange groves, and everything was bathed in sunshine. Ah, what bliss! When you have been largely without it for two years, warm sunshine is so precious. We stopped for the night at the side of a country lane. 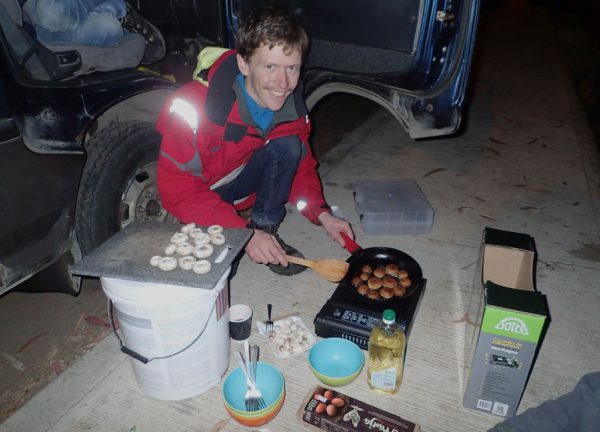 There’d been no time to furnish the van properly, and so we cooked supper in the doorway, on a one-ring burner, and our bed was a sheet of chipboard laid over the folded seats. We slept like sardines, head to tail in a row – but we slept well. The next day, when we set off, the van was making that noise again. So we fed it some more fluid. Then we let the long black conveyor-belt carry us onwards. We bypassed the city of Santiago and entered a new climatic zone and a new landscape. The ribbon of tarmac wound its way over steep hills carpeted in yellowing grass. Candelabra cacti speckled the slopes, along with algarrobo trees (the local species of acacia, and related to the European carob). We found the coast again and began to follow it – past a small town; past beaches where the waves rolled and crashed onto fine white sand; past rocky headlands which tore the sea into a mass of white foam. It would certainly not be a good place to come with a boat, but it would not be a bad place to spend the night in our wagon, I reckoned. The sun was sinking and we needed to hop off the ride and find a quiet corner. Just one more bend. Just one more hill. But there had been too many hills. But then, suddenly, the engine was hot; and then it stopped. As Nick lifted the front seats to look at the engine, a cloud of smelly smoke was released. The dip-stick revealed that there was water in the oil; and a patch of water on the road under the car showed that the radiator had burst. By a stroke of luck we’d come to a halt in the mouth of a rustic underpass. Ever optimistic, the skipper reckoned that we could persuade Grace to dash down through the underpass and then mount the slope the other side, to regain the motorway. Then we would roll back down into the little town that we’d just passed. Such was his enthusiasm that he almost managed to persuade the old girl to do it. She negotiated the tunnel under the road and even got as far as rejoining the highway; but alas, the road didn’t immediately descend, and she couldn’t cope with another hill. The third night of our holiday was spent in much the same way – because Grace was not going anywhere. She needed another new head gasket, and a new radiator, and – well, who could tell what else she might need? There was talk of rings, but frankly I was not interested in finding out. I felt that our journey was fated. Doomed. Never meant to be. 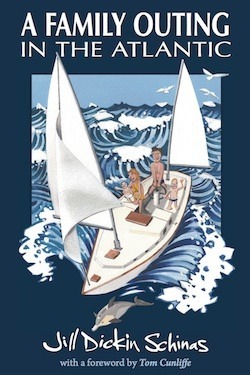 I was for abandoning ship and getting on a bus and going back home to my boat and my cat and dog. However, the other three-quarters of the crew had other ideas. 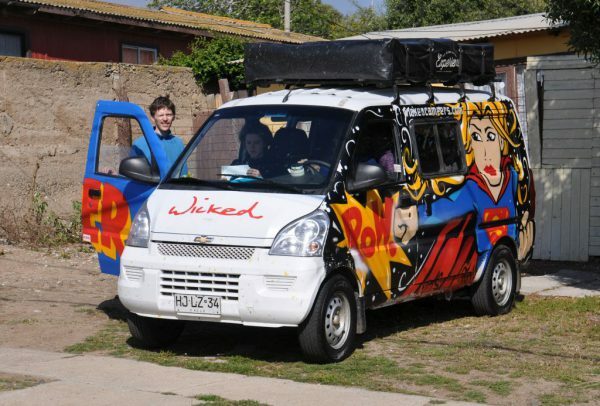 And so it was that, very early on the morning of our fourth day out, Nick got on a bus – again – and he went to Santiago; and he came back that evening driving another van. But this time it was a hired van. So – next week we’ll begin the story again, and we’ll give you a ten day itinerary for a journey between the desert and the deep blue sea.